Recently, I stumbled across a circa 1965 advertisement for Molex power connectors. Touting the durability and long life of the “low-cost” power connectors, with printed circuit nylon terminals making possible “hundreds” of insertions, the 093 connector depicted was the first true power interconnect solution to hit the market. The 093 was the power connector back in the day—and the earliest precursor to Molex Fit Family Power Connectors. The ad makes me feel nostalgic and proud to be a part of a powerful history. Surprisingly, Molex did not start out manufacturing connectors. The name Molex refers to a proprietary plastic compound first used to mold flowerpots, toys and other common products. It was only after discovering the insulating properties of the durable compound and adding metal stamping that Molex started developing wired power connectors. What is a Molex connector? The invention of and subsequent patents for the Molex connector related to substantial improvements in the terminal construction of an electric power connection. The unique pin-and-socket design, with cylindrical metal pins housed in a plastic shell, allowed pin arrangements in any combination, and pins could be keyed for proper orientation. By maximizing the pin contact surface area, the design made possible secure mating of smaller plugs and receptacles, which ultimately led to a 50% reduction in plug-and-receptacle and terminal sizes. 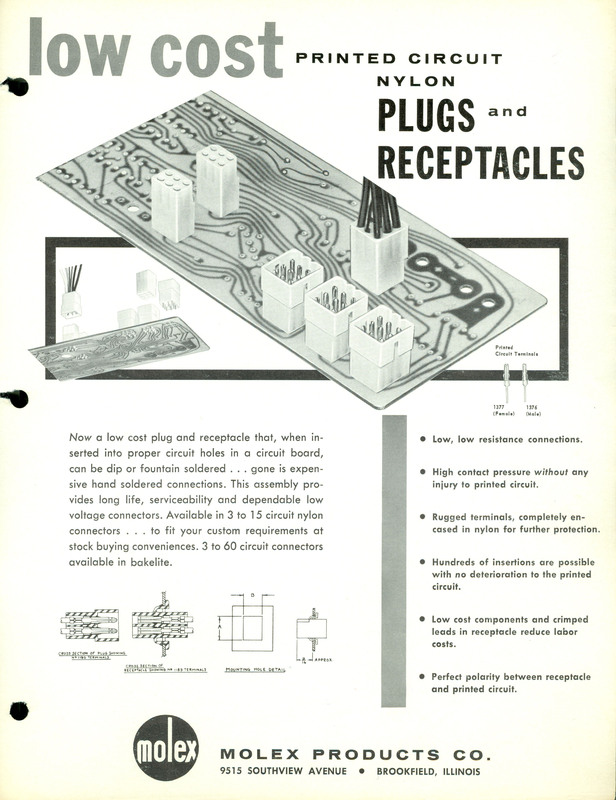 Molex helped make a wide range of electronic devices more compact with the development of .062″ terminal interconnects, the micro-miniature products of 1966. Enhancements to the original connector design included improvements to the housing design, fully isolated terminals and locking mechanisms. Molex entered the fledgling electrical appliance market by producing the first molded terminal block for GE Hotpoint® stoves. Our power connectors became a staple component in tube televisions and consumer appliances in mid-20th century modern homes. During the 60s and 70s, groovy push-button switches created new markets for Molex connectors in vending machines, stereo systems and even automatic bowling alley pin-setters—space age technologies at the time! Featuring a pre-assembled PCB solder-board-type assembly, the Molex KK® Modular Interconnect System was integral to color TV manufacturing. Molex became a go-to connector in televisions, cameras, video recorders, VCRs, pocket calculators, word processors, personal printers, fax machines and disk drives. Designed by Molex in Japan, the Mini-Fit Jr.™ connectors launched in the early 1980s. Packing higher power into smaller footprints has always been a prime driver for new power connector designs. The first Molex Mini-Fit® Connectors conserved valuable real estate on PCB boards. During the 90s, the Molex compound was phased out in connector housings, replaced by other thermoset plastic material, and eventually more environmentally friendly, recyclable thermoplastic materials. Advancements in Molex power connectivity opened new doors to applications in aerospace and defense, automotive, commercial vehicles, energy, consumer goods and home appliances, data/computing, industrial automation, medical, scientific, smartphones and other mobile devices, solid-state lighting and telecom/networking. Molex continues to push the boundaries of power in the new millennium. Staying a step ahead means being able to read the power technology landscape and predict the future. Knowing where consumers, electronics and industries are trending is vital to having the right solutions at the ready to help Molex customers achieve success. Today, of course, power connectors are ubiquitous. You are probably within arm’s reach of one right now. Every product design deserves safe and dependable long-life power connections. Molex connectors are a major force in power delivery and distribution on a global scale, offering a vast array of wire-to-wire, wire-to-board, and board-to-board configurations. Billions of Fit Family Power Connectors have shipped worldwide, including our Mega-Fit®, Ultra-Fit™, Mini-Fit®, and Micro-Fit 3.0™. Discover how Molex is still breaking new ground by packing even more power into less space—check out our Nano-Fit™, which features the industry’s smallest isolated headers.